To take advantage of one of those rare days this year that Gil was able to take a vacation day that happened to coincide with mine, we decided to head down south to San Diego (about an hour's drive from Murrieta) to visit a couple of the California Missions. 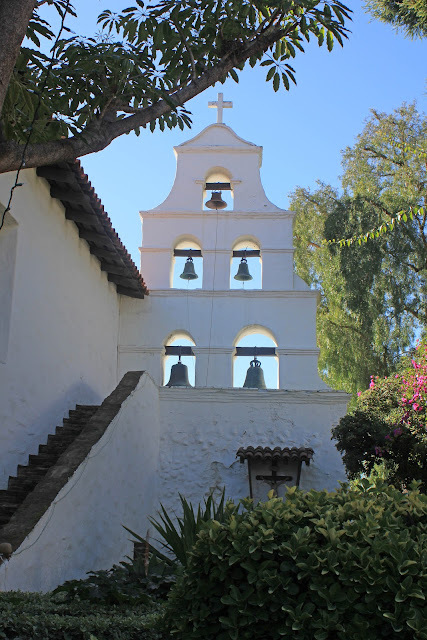 I've said this before, but I'm determined to see all 21 of California's missions sometime in my lifetime. 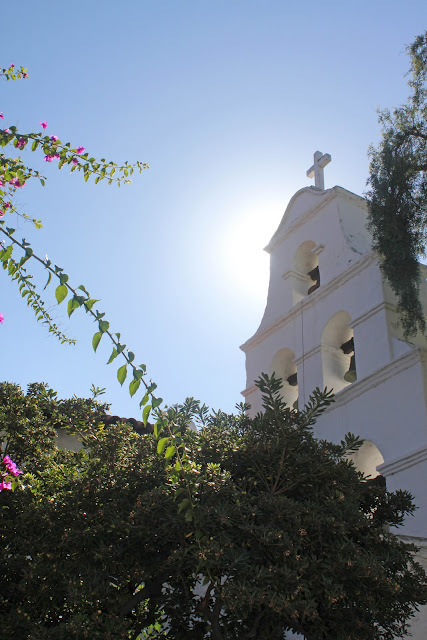 First stop: Mission San Diego de Alcala, aka the "Mother of the Missions." 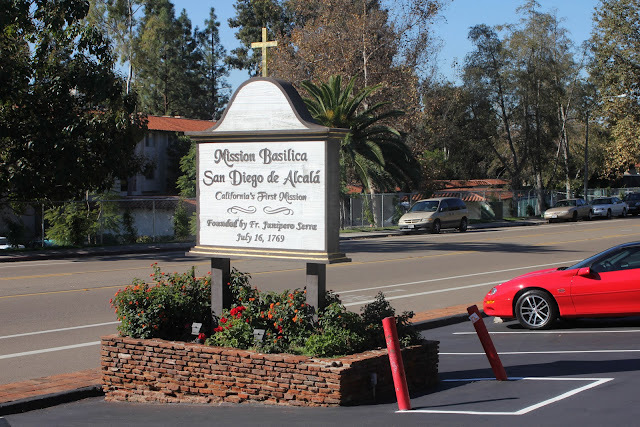 Parking lot at entrance off of San Diego Mission Road. 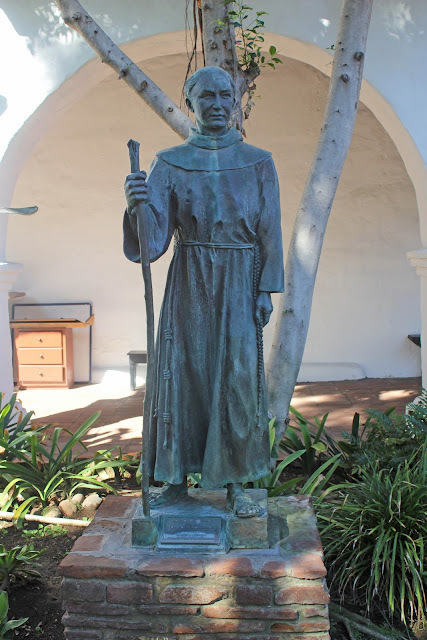 Mission San Diego is California's first mission (and, therefore, first church) and was founded by Father Junipero Serra on July 16, 1769. In 1774, the mission and the Spanish presidio (i.e., a military fort) were relocated from an area above Old Town San Diego to its present site, which had better land for farming, a more reliable source of water, and was also closer to the native Kumeyaay villages. 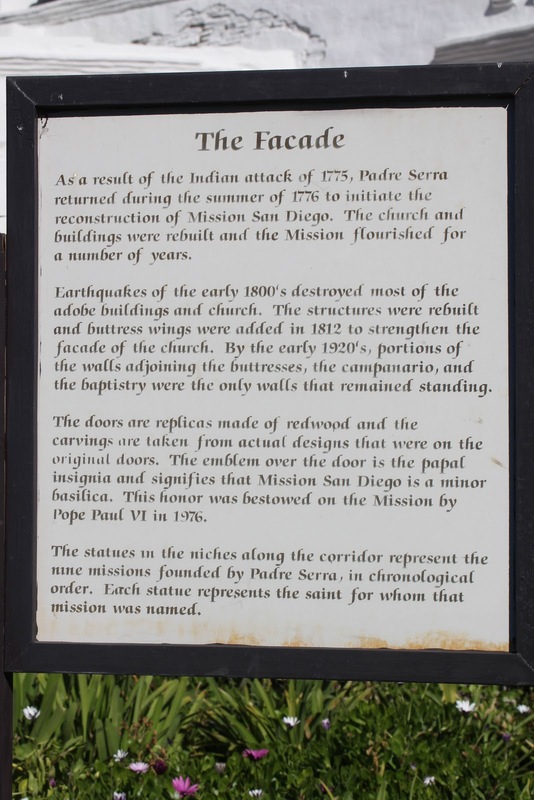 "In 1775 , just one year after the first adobe church was completed, the mission was attacked by Indians who destroyed it by burning the dry tinder buildings to the ground. 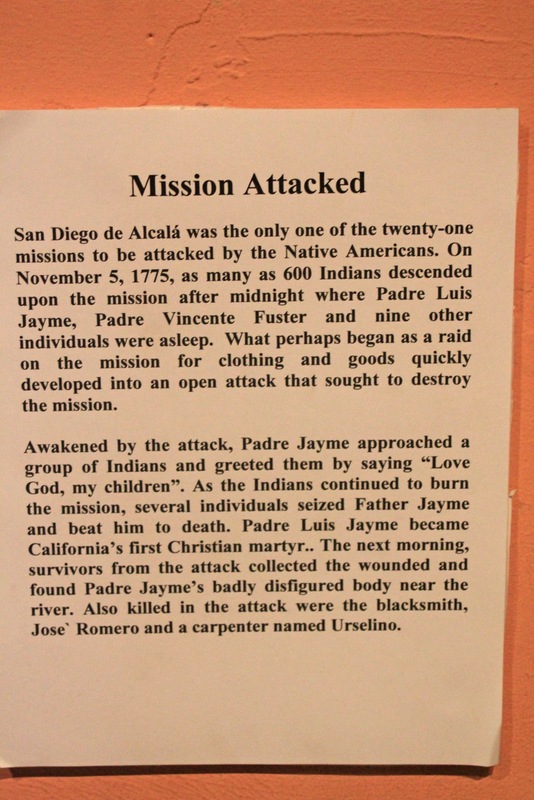 Padre Luis Jayme was killed in this attack when he tried to calm the Indians. Padre Jayme became the first Christian martyr in California and is buried in the Mission Sanctuary. 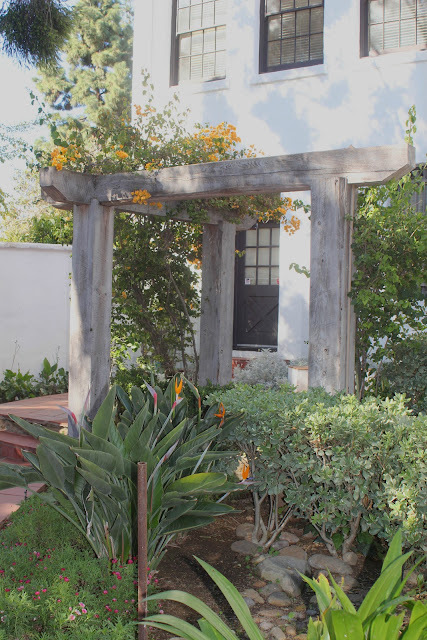 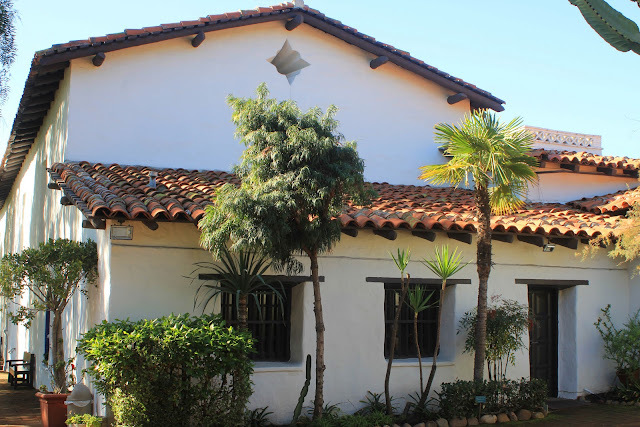 Padre Serra returned to the gutted site in 1776 and began to restore the church and mission buildings...The year 1797 opened another chapter in the growth of the San Diego Mission. 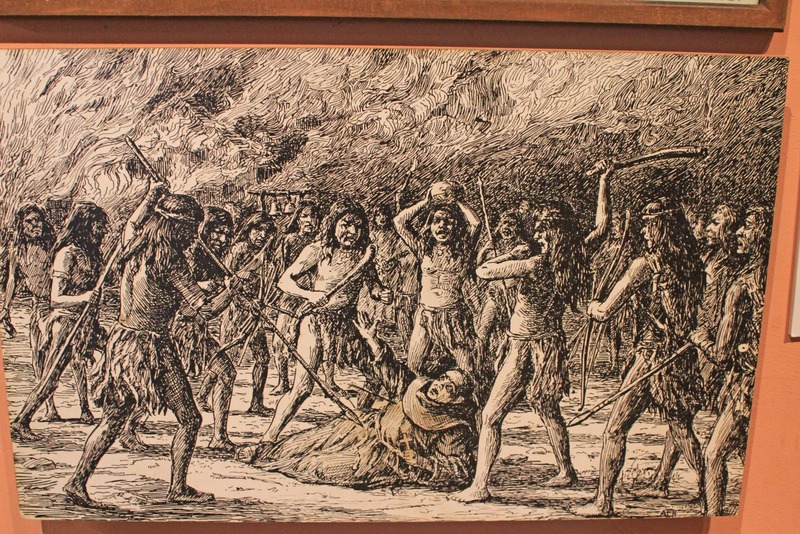 Five hundred and sixty-five Indians received baptism which brought the number of converts to 1,405. 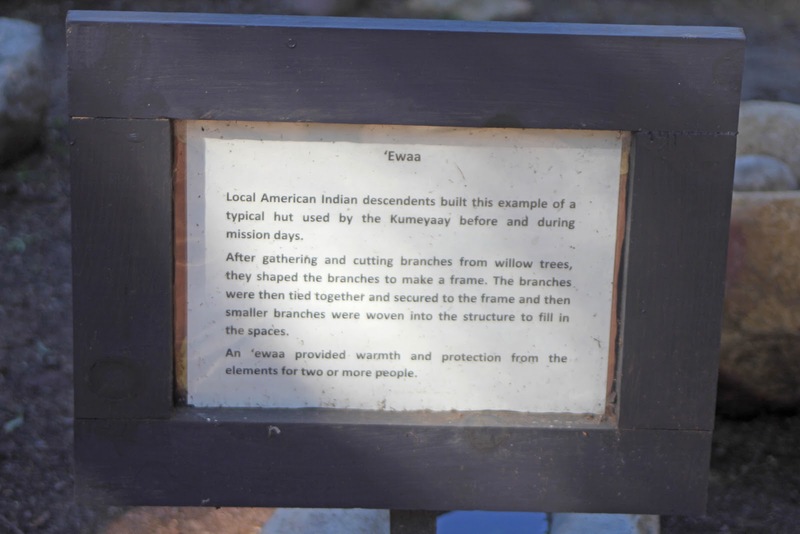 The land area grew to 55,000 acres. 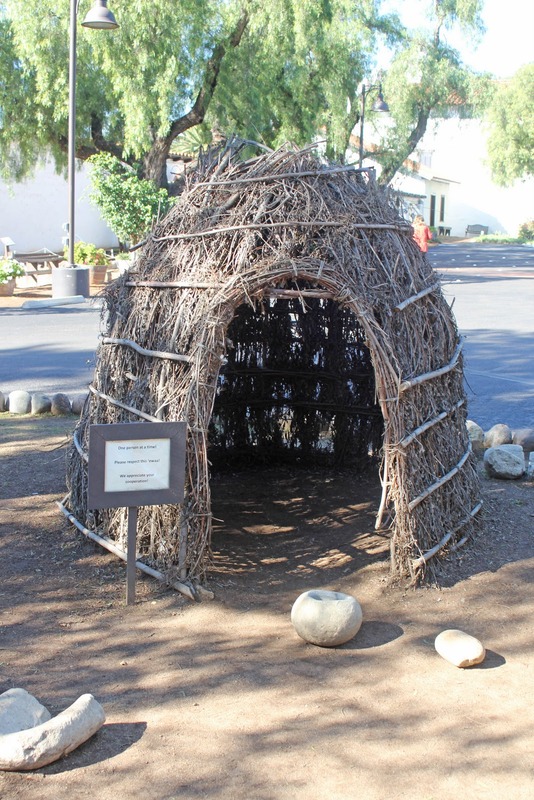 Vineyards, orchards, and vegetable gardens began to thrive and wheat, barley, corn and beans were harvested. It is recorded that the mission owned 2o,000 sheep, 1o,000 cattle, and 1,25o horses. 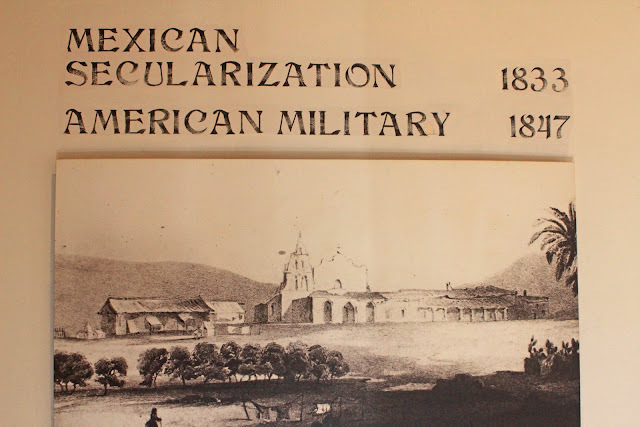 In 1821, when Mexico gained its independence [from Spain], Mission San Diego was given over to Santiago Arguello. After the U.S.-Mexican War and the signing of the Treaty of Guadalupe Hidalgo in 1848, the U.S. Cavalry used the mission as a military presence from 1850-1857. 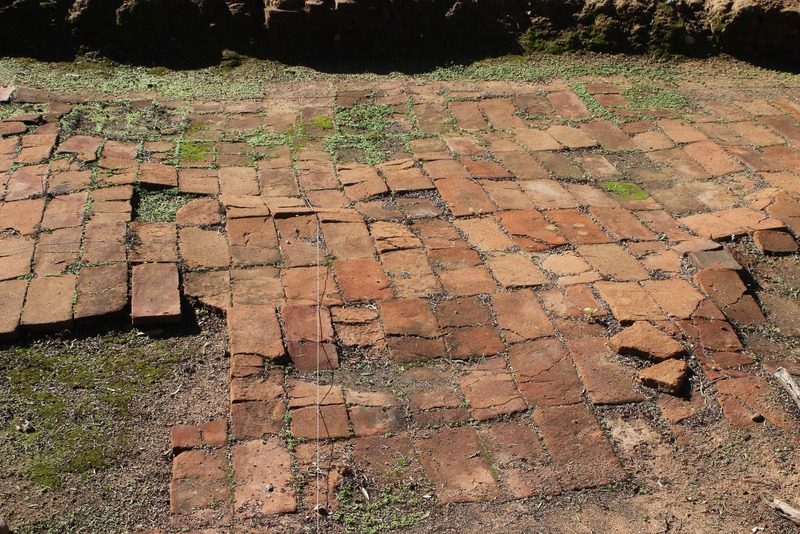 The soldiers made some temporary repairs to the decayed buildings in order to make them habitable. In 1862, the Mission lands were restored to the Church by order of President Abraham Lincoln...The present mission was named a minor basilica by Pope Paul VI in the bicentennial year of 1976. Today, it serves as an active parish for the Catholic community..."
Additional notes: The mission became a school for Native American children in 1892 and the current church was rebuilt in 1931 to the resemble the mission church of 1813. 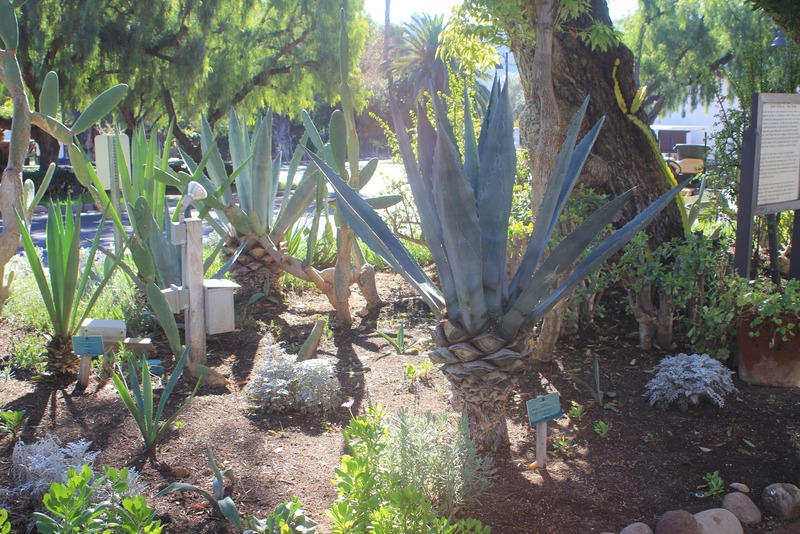 Bed of assorted Agaves (mostly from Mexico) in front of the church, including Agave americana, i.e., 'Maguey' (large specimen in the foreground), and Agave attenuata. 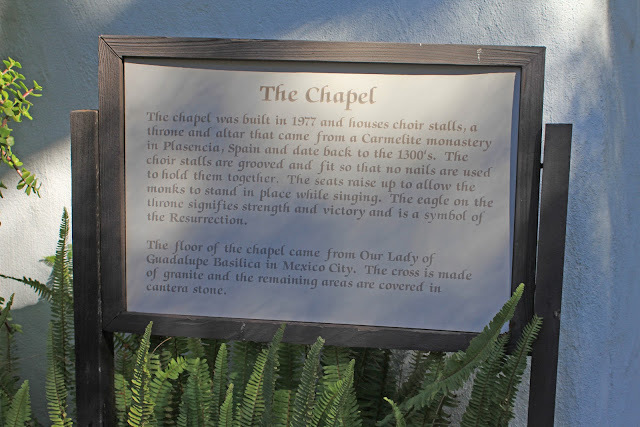 Inside of La Capilla (The Chapel). 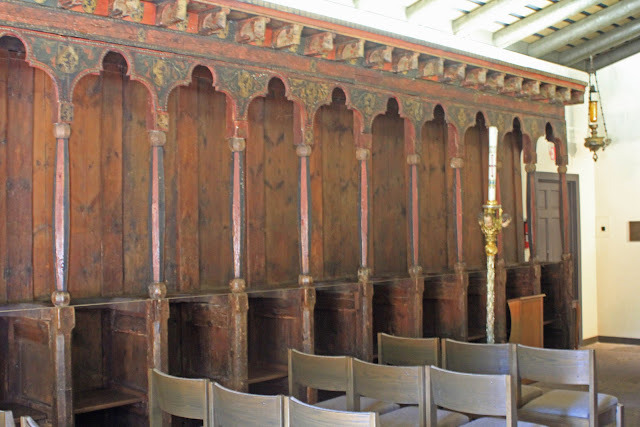 Dating back to the 1300s, the throne and altar came from a Carmelite monastery in Plasencia, Spain. 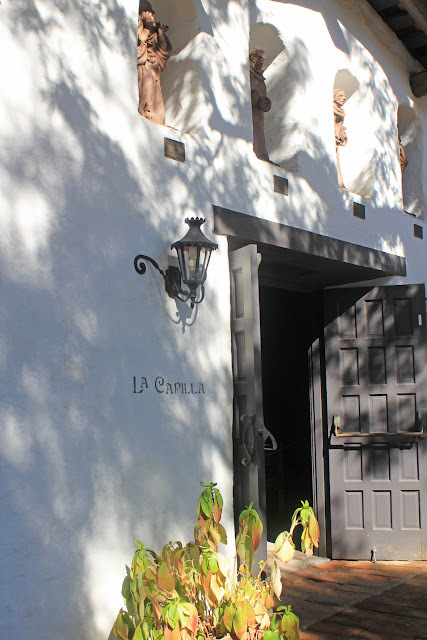 Small courtyard next to La Capilla. The ubiquitous Silk Oak (Grevillea robusta). 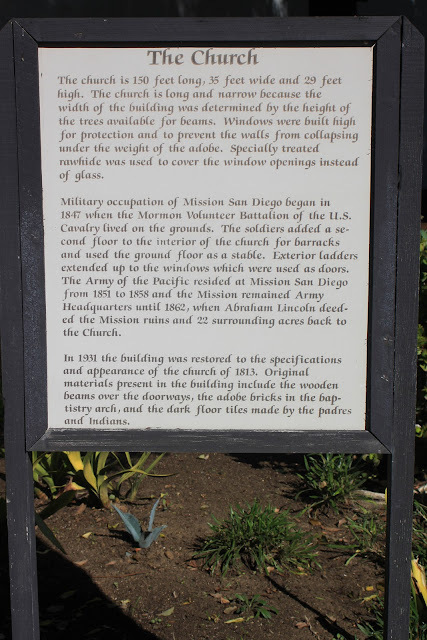 This one's huge, like the one we saw at Mission San Juan Capistrano, but I wasn't able to get a good shot of the canopy. View towards church from La Capilla (courtyard area next to museum). 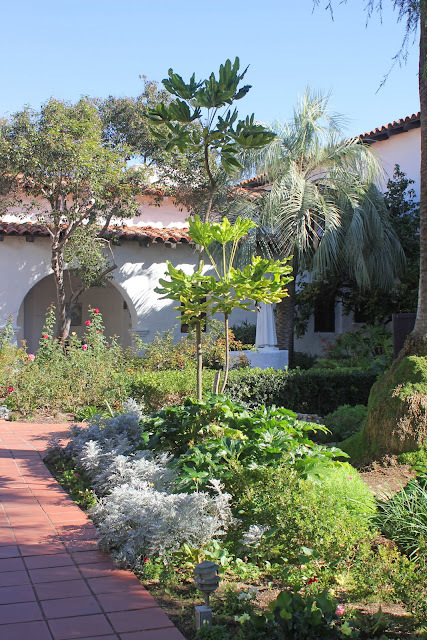 Garden (courtyard behind the church). 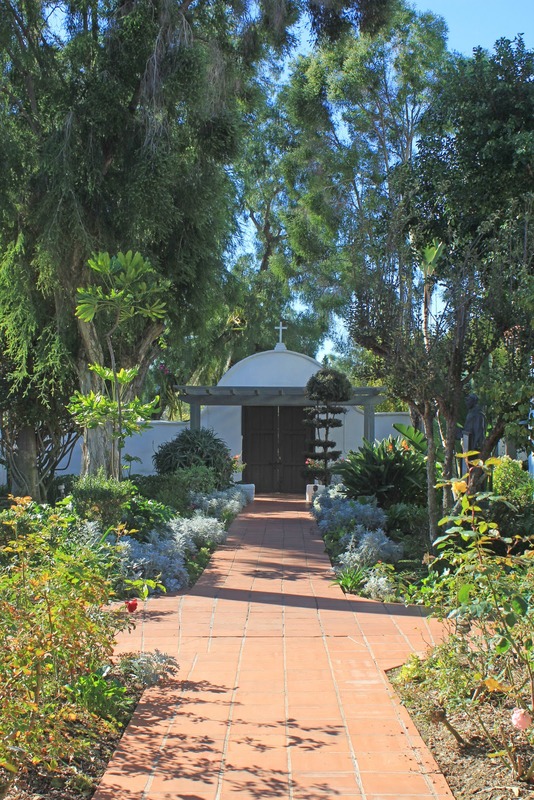 St. Francis of Assisi fountain/wishing well (Garden). 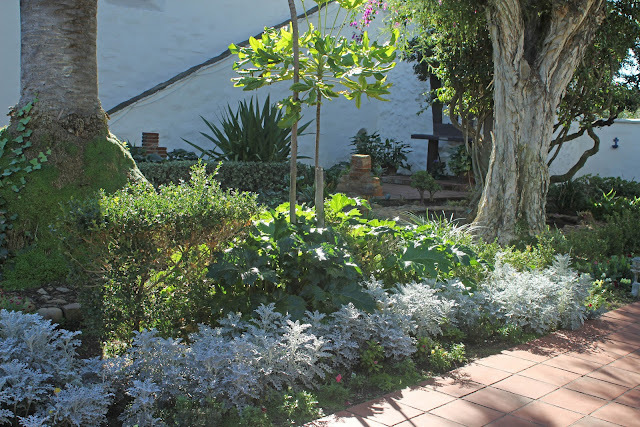 La Sacristia (from the Garden). Bird of Paradise and Bougainvillea, St. Anthony Garden. 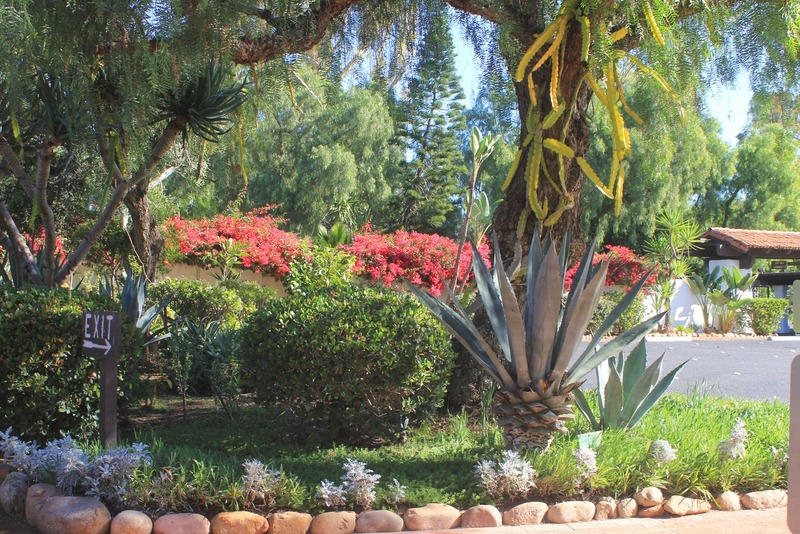 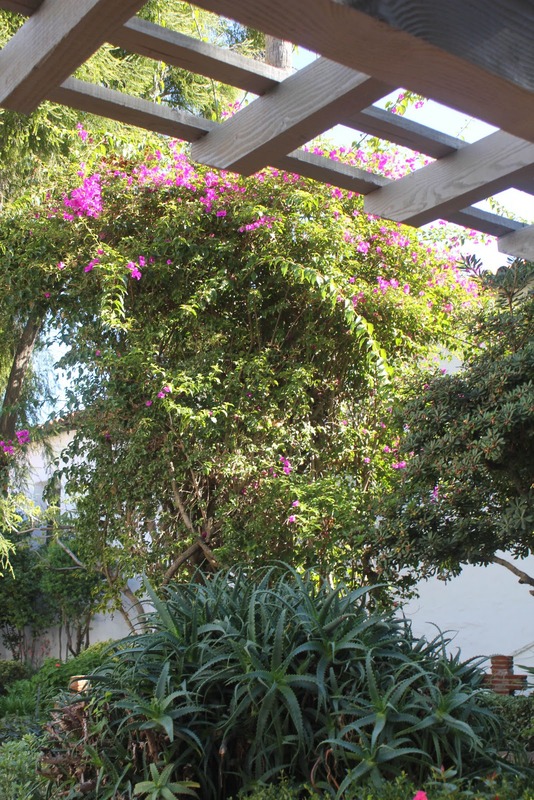 Bougainvillea and African tree aloe (Garden). 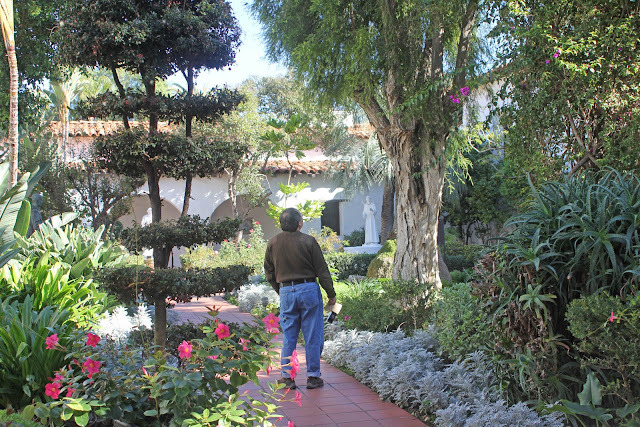 Gil, contemplating in the Garden. 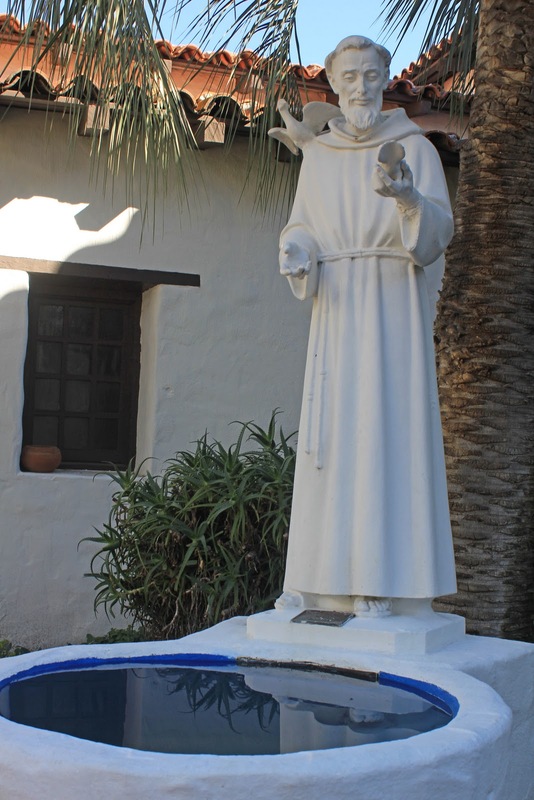 Fray Junipero Serra statue (Garden). 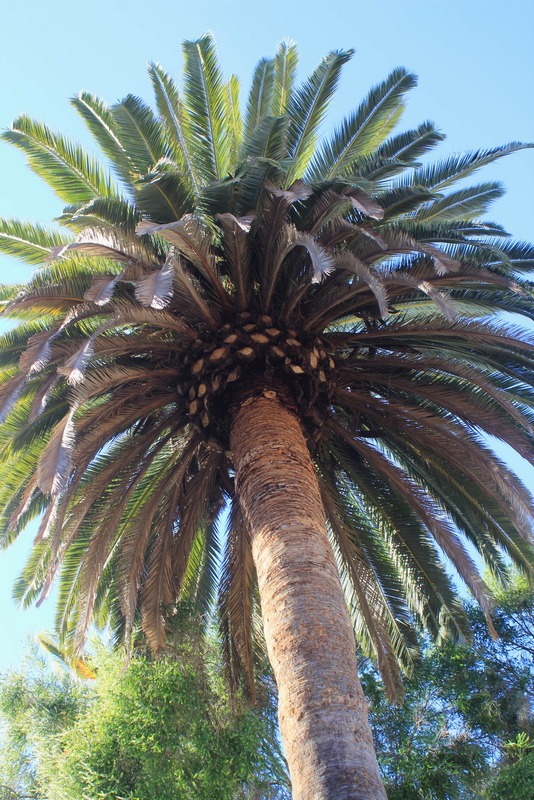 Don't know for sure, but this big guy looks like a Canary Island Date Palm (Phoenix canariensis) to me. Campanario (bell tower), as seen from behind in the Garden. 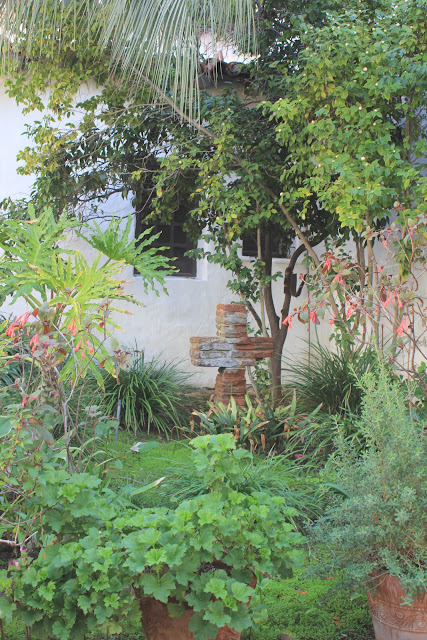 Campanario (as seen from the Garden). Example of an 'Ewaa hut used by the Kumeyaay. 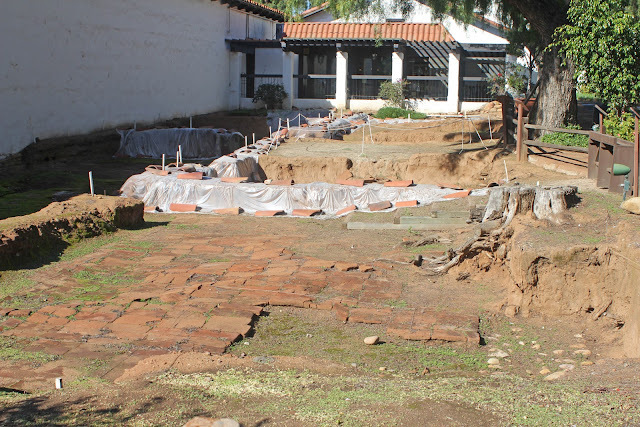 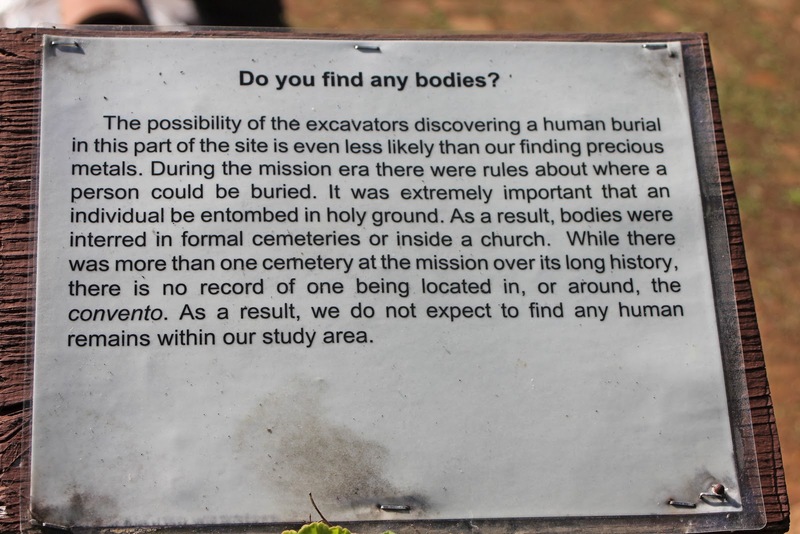 Archaeological site (Convento Wing excavation project). 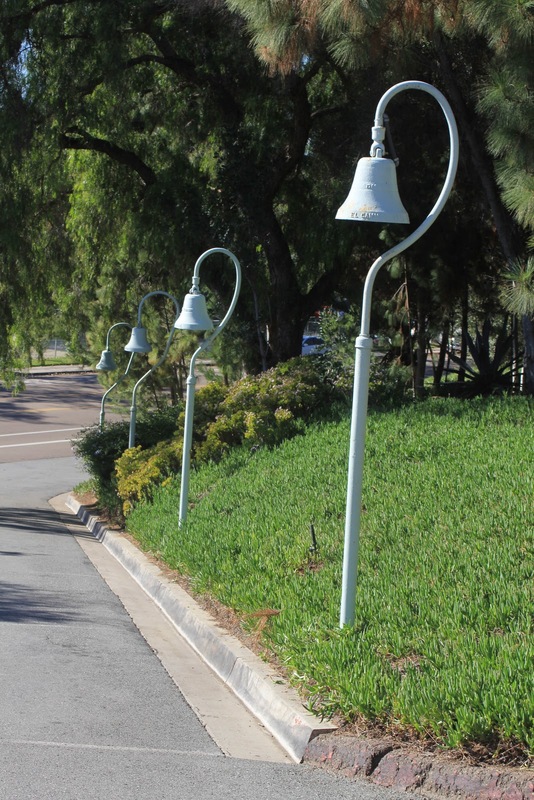 Those signature El Camino Real bells, looking strangely out-of-place along that uber modern driveway. 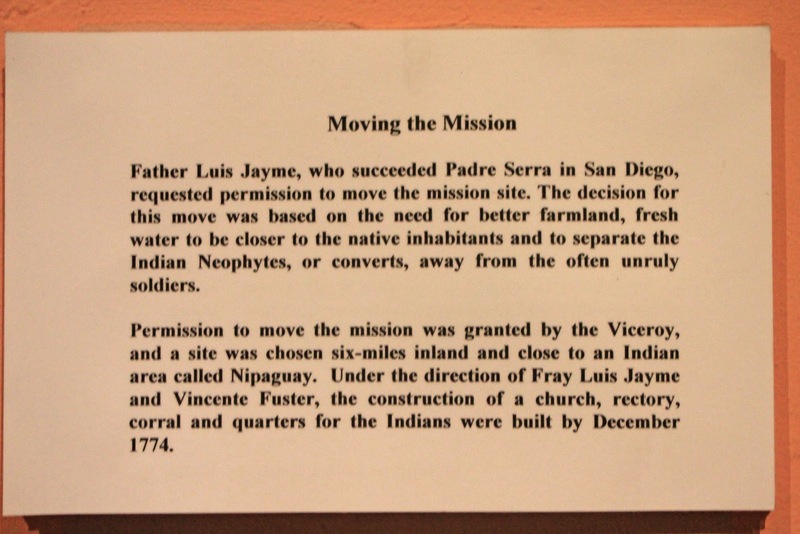 San Diego is the first of the 21 California missions. 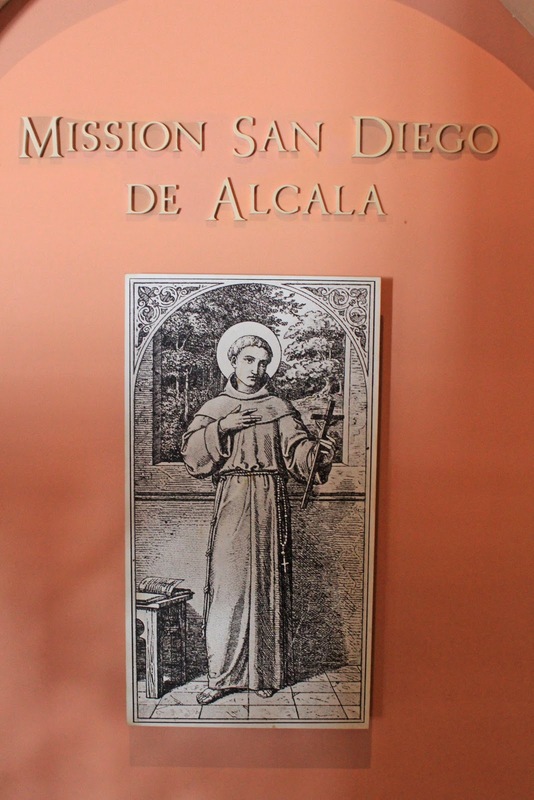 Named For: St. Didacus of Alcala, a 15th century Spanish Franciscan. 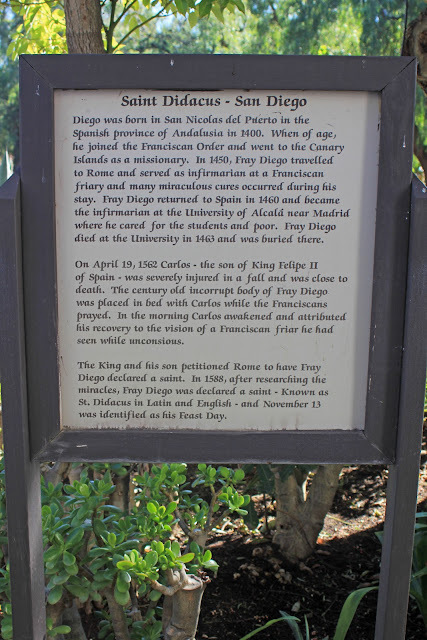 The Bay of San Diego was discovered in 1542 by Juan Rodriguez Cabrillo but named San Diego in 1602 by the explorer Sebatian Vizcaino, who mapped the coast. Prominent Missionary Leaders: Most of the important early missionaries served or officiated at the Mission San Diego, including Fr. Serra's closest friend Fr. Juan Crespi (in 1772). Serra's successor, Fr. Fermin Francisco de Lasuen served at this mission for 10 years (from 1775-1785). Indians Joining this Mission: The prominent Indian tribes in the area were the Tipai-Ipai. 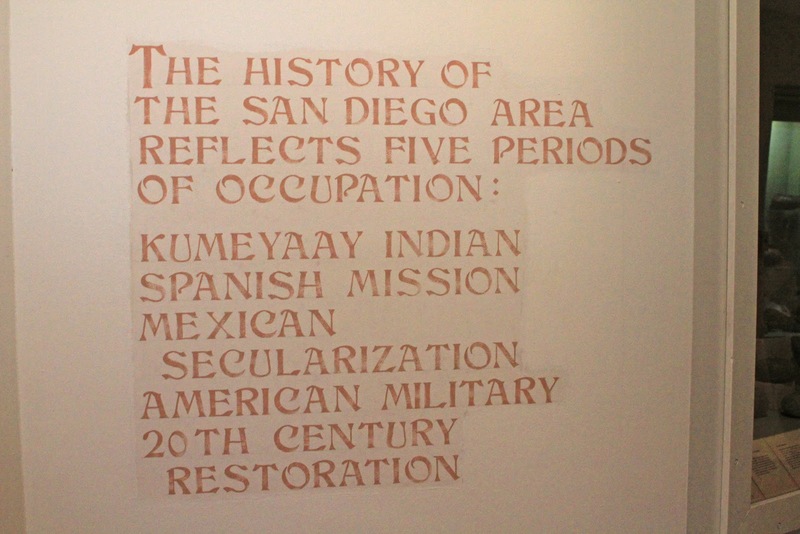 The native term most frequently used for the San Diego natives is Kumeyaay, one of the principal dialects. The Spanish called the neophytes at Mission San Diego Diegueno. 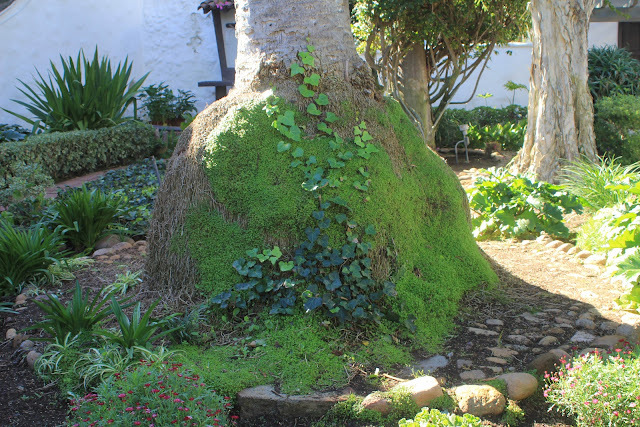 Unlike other missios, the neophytes at San Diego continued to reside in traditional villages in part due to food shortages at the mission. 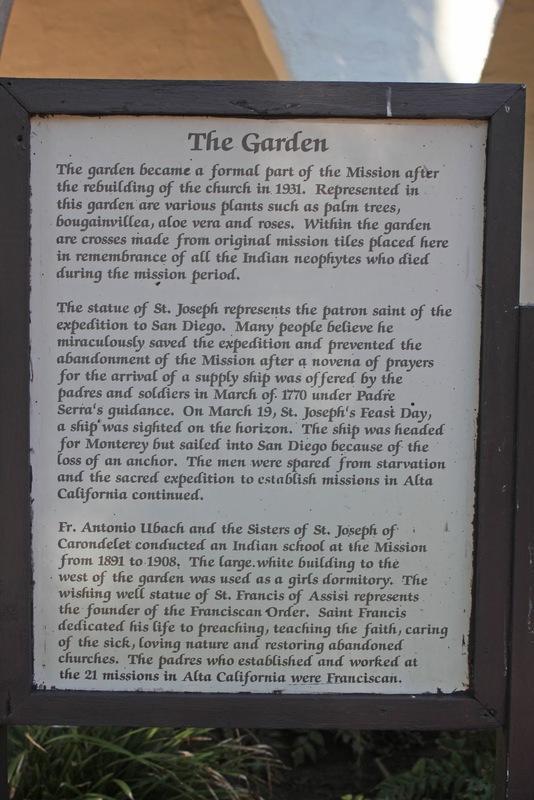 Mission Site: The mission was originally located on Presidio Hill overlooking the bay, at a location called Cosoy by the natives. 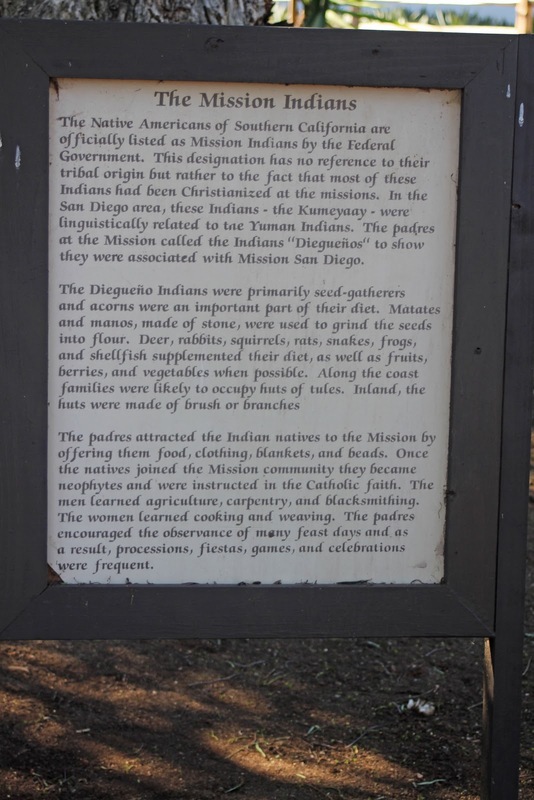 The mission was relocated about 5 1/2 miles inland at the village of Nipaguay in 1774. 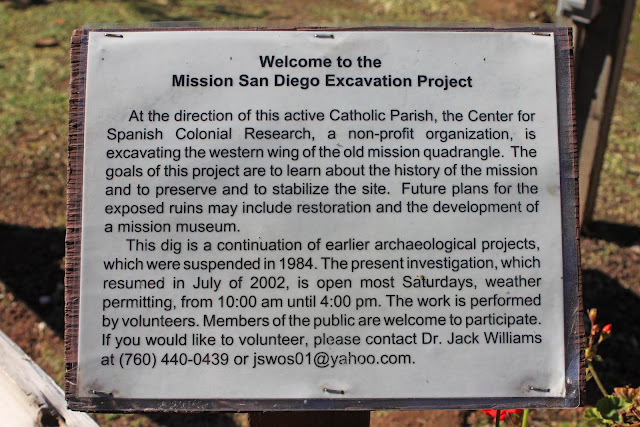 Water Source: A dam was constructed 6 miles upstream from the mission, on the San Diego River. 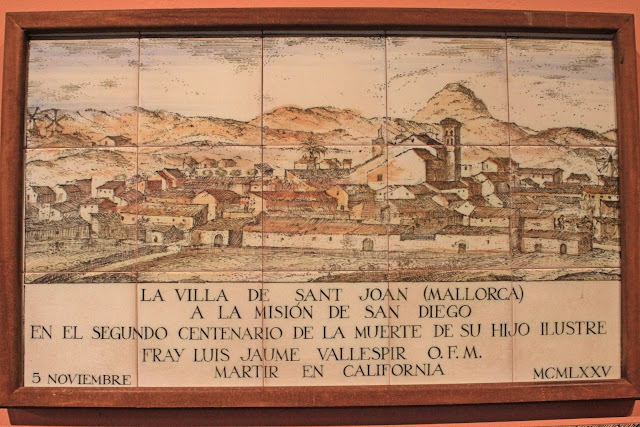 Water was brought to the foot of Mission Hill via an aqueduct or zanja and then by way of a norja or waterwheel, into the mission. 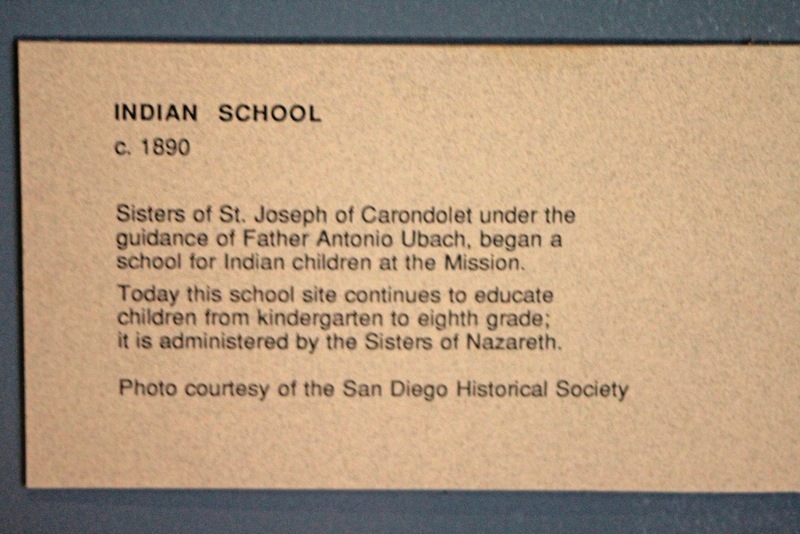 Population: The neophyte population at San Diego in its peak years (1797-1831) averaged over 1,500. 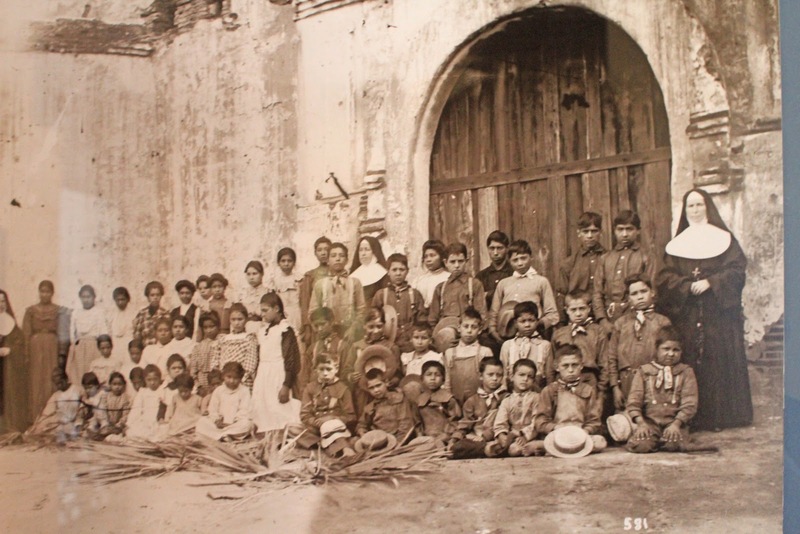 The highest population was 1,829 in 1824. Livestock: In 1773 (the first year for which we have records) the mission had 40 cattle, 74 sheep, 55 goats, 10 pigs, 29 horses and 28 mules, a total of 245 animals. 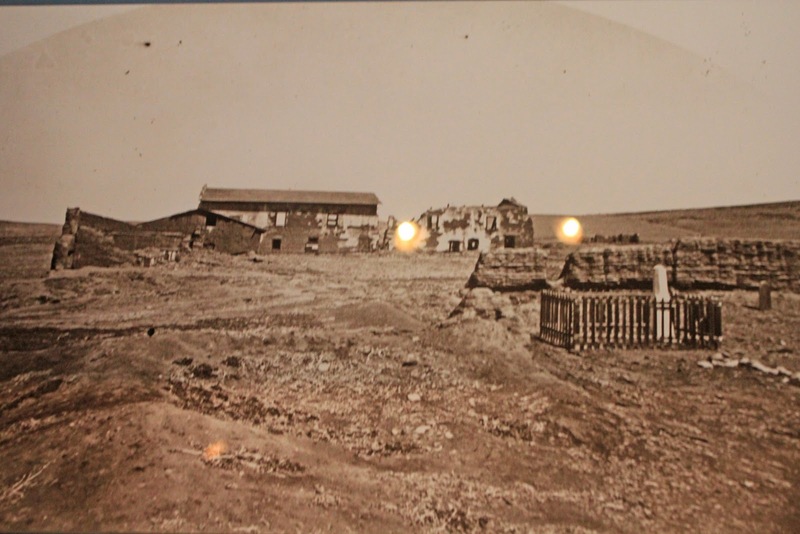 In 1822 the mission had over 30,000 animals, including 9,245 cattle and 19,000 sheep. 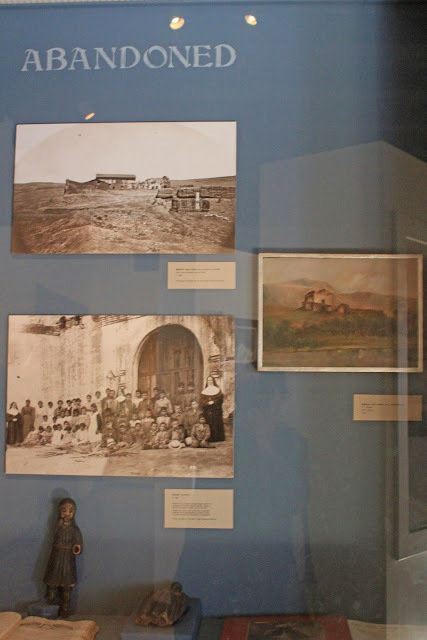 Agricultural Output: Over the years 1782-1832 the mission produced 259,545 bushels of wheat, barley, corn, beans, peas, lentils, garbanzos and habas (broad beans). 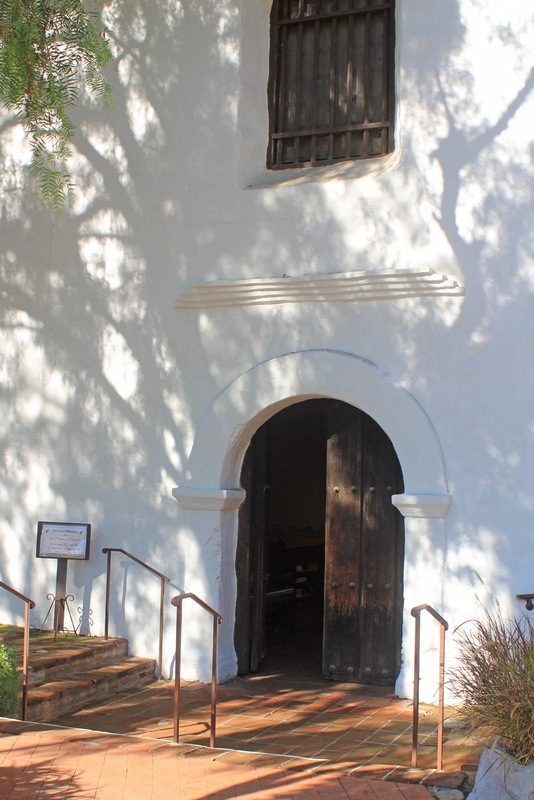 Mission Church: The church was originally built in 1813 (the third church on this site). 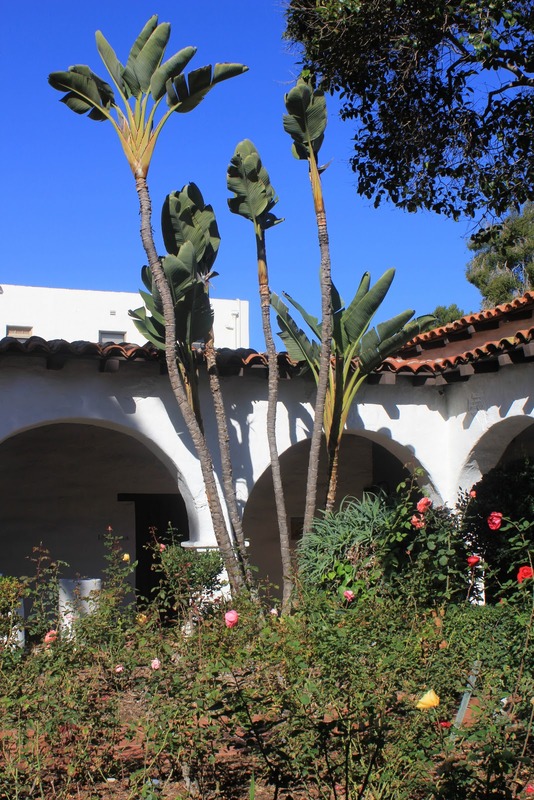 It was rebuilt and finally restored in 1931. Mission Bells: A striking 46' campanario (bell wall) on the left side of the church rises above the mission gardens and contains five bells. The largest bell, called Mater Dolorsa weighs 1,200 pounds. 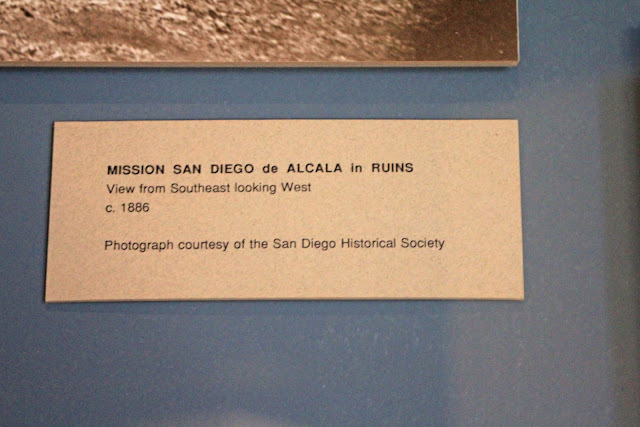 It was cast in San Diego in 1894. 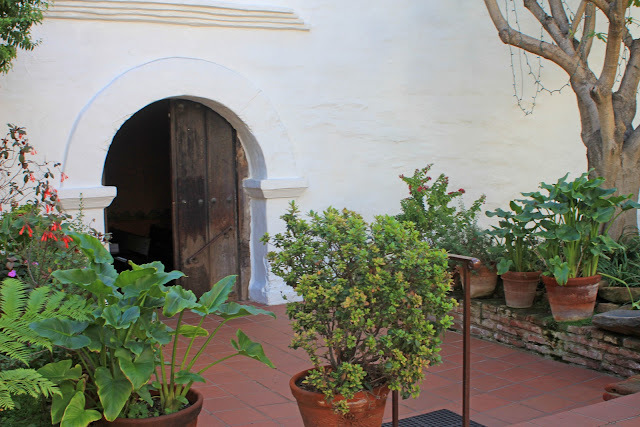 Mission Art: The baptismal font in the museum is original to Mission San Diego. 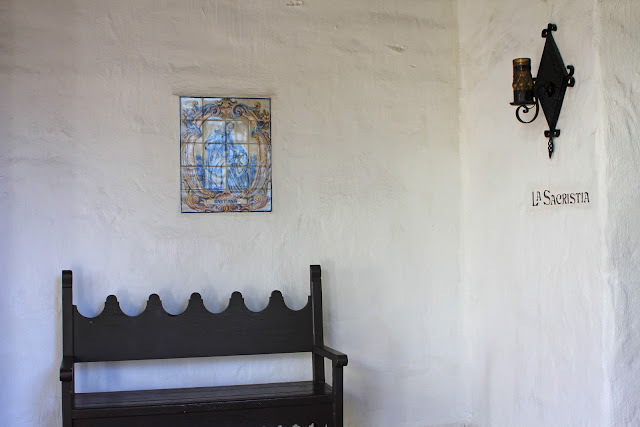 The baptismal font in the church is a replica of the one in which Fr. 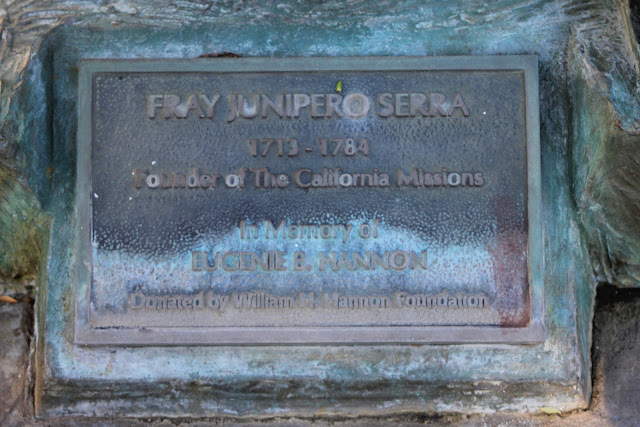 Junipero Serra was baptized in 1713 in Petra on the island of Majorca. 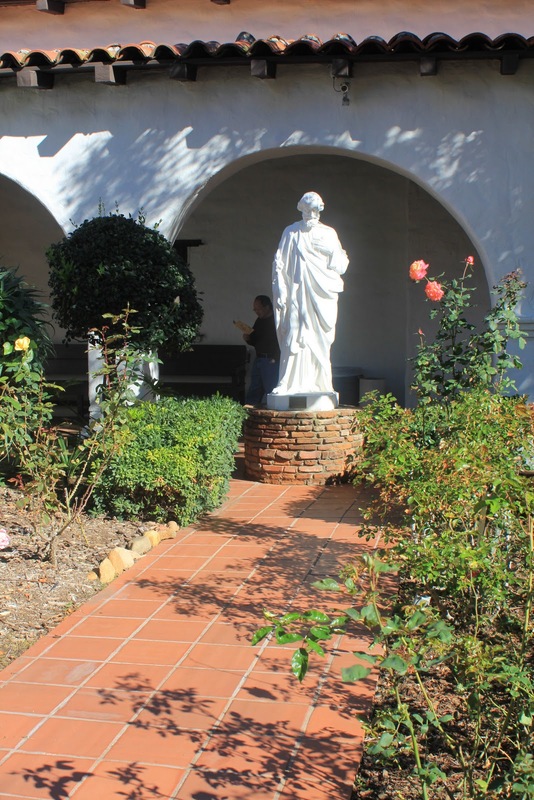 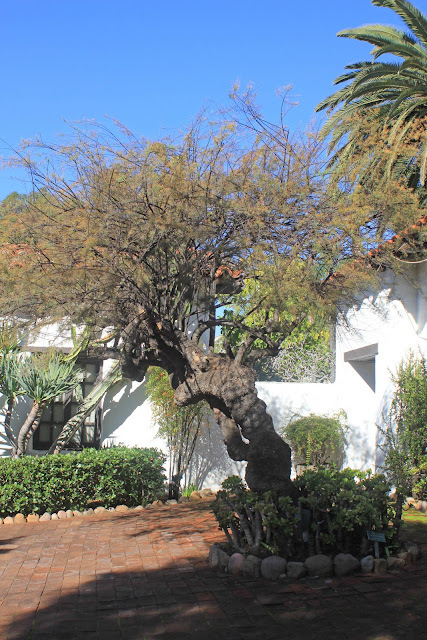 Special Attraction: A popular stop on the mission tour is a recreation of Fr. 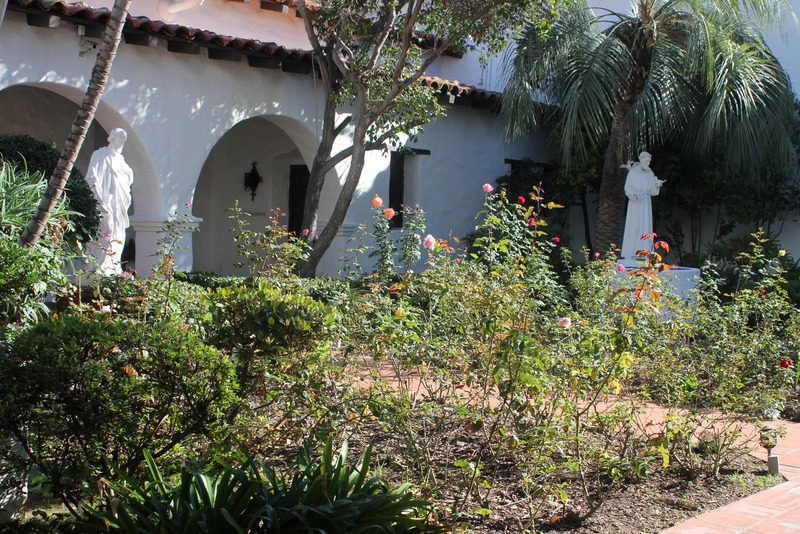 Serra's cloister or living quarters. Significant Events: The mission was destroyed in an Indian attack in November 1775. 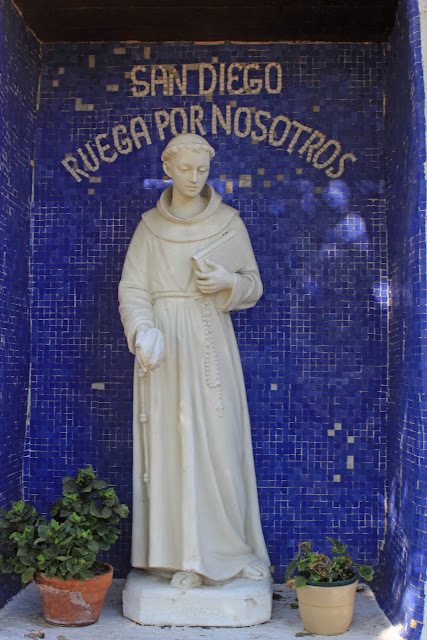 One of the missionaries, Fr. Luis Jaime, and two others were killed, including Urselino the mission carpenter and blacksmith Jose Romero. 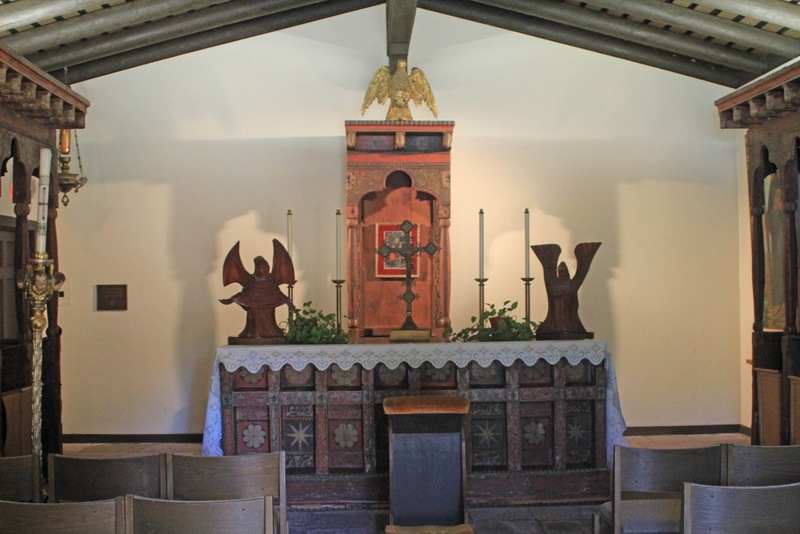 Year Returned to Catholic Church: 1862, in a proclamation signed by President Abraham Lincoln. Current Status: Active Roman Catholic Church of the Diocese of San Diego, properly referred to as the Mission Basilica San Diego de Alcala. 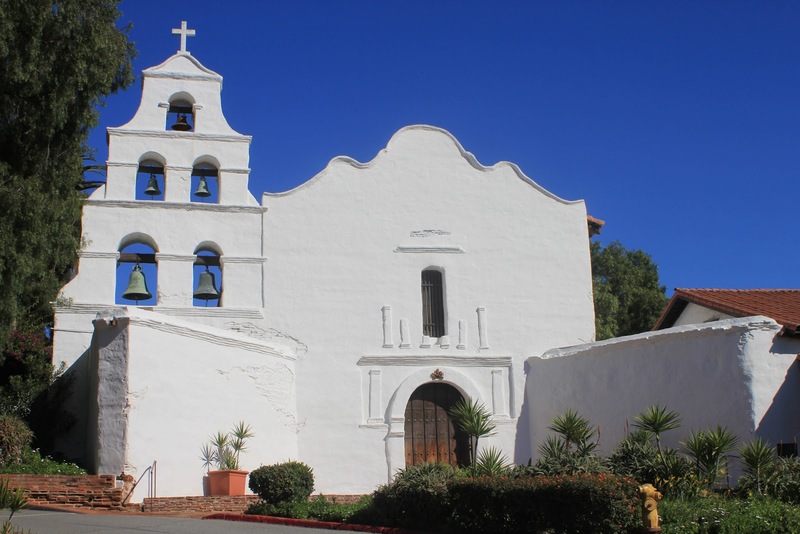 Interesting Facts: In 1818 a sub-mission or asistencia, Santa Ysabel, was established in the mountains some 60 miles east of San Diego. 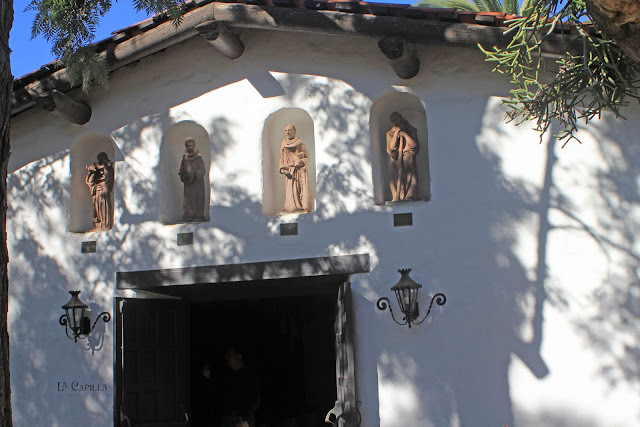 Santa Ysabel fell into ruin after secularization but a new chapel was built in 1924 by a Canadian born priest, Fr. 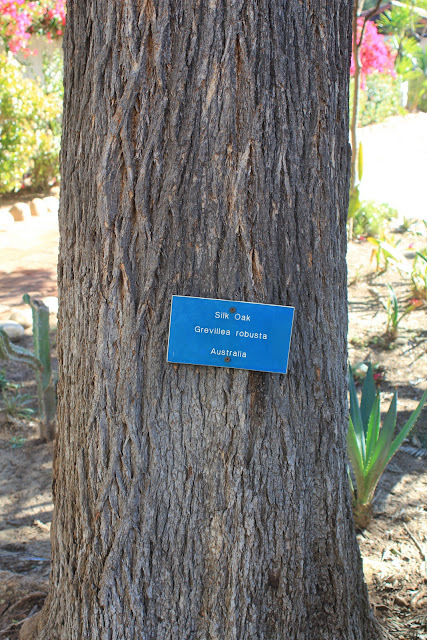 Edmond La Pointe, who served the area for 29 years. The mission was used by the U.S. Army (various companies of artillery and cavalry) from 1853 until about 1858. 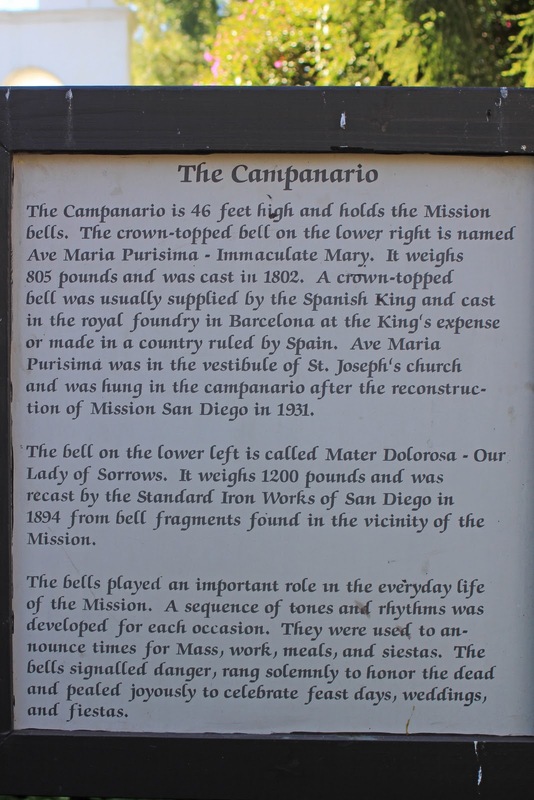 The mission was made a Minor Basilica in 1976 by Pope Paul VI.